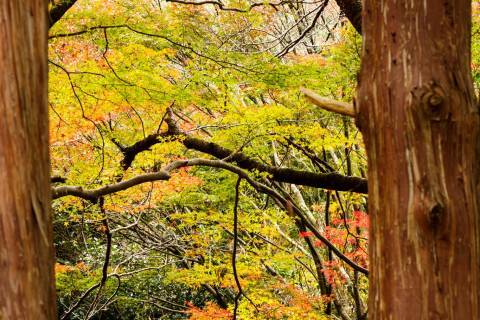 A Tendai sect temple located a short trip away from the city center in Yamashina Ward, Bishamon-dō is famous for its 150-year old cherry tree and lovely autumn maple leaves. Worshipping Bishamonten (Vaisravana), one of the Four Heavenly Kings of Buddhism, the temple is home to an interesting collection of fusuma-e screen paintings and a charming pond garden. A monzeki temple with a history of imperial princes serving as head priests, Bishamon-dō is also known as a temple with a connection to the story of the famous 47 rōnin, and one location visited by a parade of reenactors who participate in the 47 Rōnin Festival (Yamashina Gishi Matsuri). While exploring the temple rooms look for paintings done in “reverse perspective representation” that seem to change depending what angle you view them from. Those who only wish to pray can enter the Hondō (main hall) of Bishamon-dō without paying the temple’s entrance fee, but if you plan to explore the interior, please pay the fee at the reception area in front of the hall. This is where the temple’s principal object of worship, a wooden statue of Bishamonten carved by the Tendai sect founder, is kept. Colored bright vermilion, the main hall is decorated with wood carvings of flora and fauna and features a small karamon (Chinese-style) gate. The building houses a large painting of Bishamonten and rows of glowing red lanterns, and the interior ceiling of the hall is covered in a pattern of phoenixes, their colorful shine blackened by centuries of smoke from incense and fire rituals. The Reiden hall, originally built in 1563 to serve as a mausoleum at the imperial palace, was dismantled and rebuilt at Bishamon-dō in 1693 by one of the imperial princes who served as a monk at this temple. Within is enshrined a statue of Amida Nyorai (Amitabha), the Buddha of Immeasurable Light and Life, alongside portraits and memorial tablets connected to the imperial family. Curled on the ceiling as if protecting the hallowed space is a great ink dragon in the clouds painted by Kanō Eishoku (later known as Kanō Morinobu), a famous artist of that time. Keep an eye on the dragon’s gaze as you walk around the room, and you may notice that by a trick of angle its eyes seem to follow wherever you go. 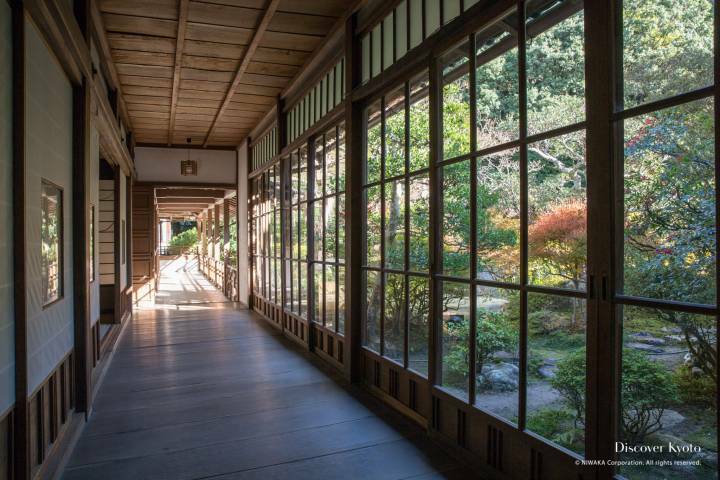 Donated by Emperor Gosai, the Shinden hall is home to many Tangible Cultural Properties in the form of 116 fusuma-e, paintings done on screen partitions within the hall’s many rooms. These fusuma-e are all attributed to Surugadai School of Painting founder Kanō Masanobu, the foster son of Kanō Tan’yū, one of the Kanō School’s most well-known artists. Utilizing “reverse perspective representation”, many points on the fusuma-e appear to change depending on what angle you look from. While exploring the many rooms, look carefully at the child in a boat, the scholars around a desk, and the koi fish on the wooden board while walking back and forth past the image. Constructed in the Edo period, this pond garden behind the Shinden hall is meant to be enjoyed from all sides. Entry into the garden isn’t allowed, but you can observe it from various angles from the temple hall walkways. At the back of the pond is a small altar surrounded by maple trees that turn a gorgeous red in autumn. The shape of the pond is considered to be a representation of the kanji for “mind”, and it features stones standing for a turtle and a plover, as well as a meditation stone. Bishamon-dō is most famous in the spring and fall seasons for its cherry blossoms and kōyō (autumn leaves). The large shidarezakura (weeping cherry tree) in front of the Shinden hall is over 150 years old and a whopping 30 meters in crown diameter, blooming its best in early to mid-April. The approach to the temple’s Chokushi-mon gate is particularly popular in autumn, when the maple trees lining the stone approach turn brilliant shades of red. In addition to these more renowned seasons, the shrine also has a large wisteria near the Niō-mon gate that can be enjoyed in May and is gorgeous in the lush new green season in spring. One of the most helpful things a tourist longing for knowledge might encounter at a storied site in Kyoto is an English language audio guide. Here at Bishamon-dō temple you can borrow an audio guide at the entrance to the main hall, which includes a pen-shaped audio player and a handy temple map. Rather than dealing with numbers or a constant stream of information, just touch the pen to the speaker mark on the room you are in or the painting you are looking at to hear a native speaker’s voice explaining everything you’d need to know! After you’ve learned all the interesting tidbits of information the audio guide has to offer, return it at the entrance to the main hall on your way out! Bishamon-dō was originally founded in 703 by order of Emperor Monmu on Izumo Road to the north of the imperial palace under the name of Izumo-ji. The founding head priest was Gyōki (668–749), a monk famous as the father of Japanese mapping and well-known for his charitable efforts towards the common people. He became the founder of many hospitals for the poor and was concerned with preaching Buddhist precepts to all people. Embroiled in several conflicts that engulfed Kyoto over the centuries, the temple’s original site was eventually destroyed. 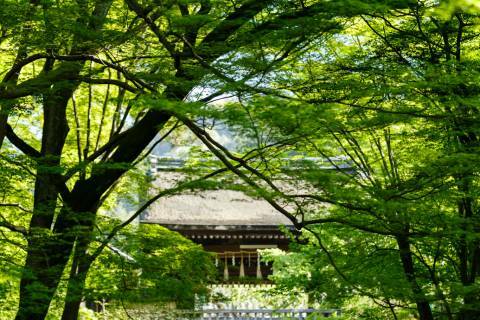 When rebuilt in 1665, the temple was moved to the Yamashina area southeast of the city proper. In 1678, one of Emperor Gosai’s sons, Prince Kōben, entered the temple, bestowing on it the title of monzeki, important temples led by members of the imperial family who had taken the tonsure. 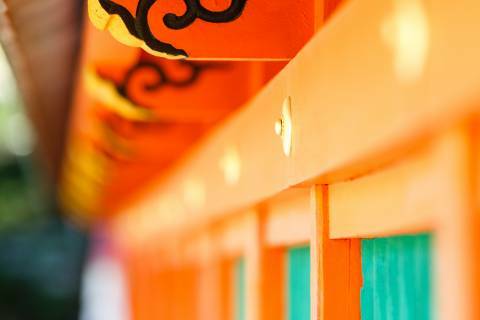 After the prince became a monk, Emperor Gosai donated several buildings to the temple from imperial properties, such as the Chokushi-mon gate and the Shinden hall, which used to be part of his palace. The founder of the Tendai sect, Saichō (known posthumously as Dengyō Daishi), is said to have been the one who carved the principal image of Bishamonten at this temple from wood left over after creating the Medicine Buddha Yakushi Nyorai for the Tendai sect headquarters of Enryaku-ji temple on Mt. Hiei. It is said that he worshipped three times for each stroke of the chisel when creating the statue, a method called ittō senrai (“one strike, three bows”). 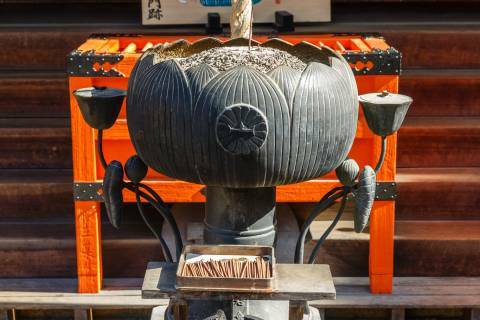 The temple’s name of Bishamon-dō comes from this wooden statue, to which parishioners pray for prosperous trade and the safety of their families. It is also said that Dengyō Daishi passed on the secrets of a special ascetic practice designed to turn disasters into fortuitous events called chinjōyasha-hō to the monks of Bishamon-dō. • Kigan Goma-tomo fire rituals are held each day at 2 pm. • Shakkyō sutra copying meetings are held on the 3rd Sunday of every month from 10 am. * Some dates are subject to change depending on the year. Though Discover Kyoto strives to update accordingly, please check Bishamon-dō’s official site for confirmation.